(Kansas City, Mo. – March 12, 2014) Beginning last fall, the Kansas City Area Transportation Authority (KCATA) introduced a 31-Day Bus Pass as a pilot. KCATA is pleased to announce full implementation of the new pass beginning March 25. 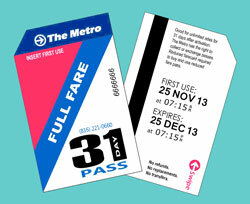 The new 31-Day Pass replaces the current calendar-based Monthly Bus Pass. It is available at all Metro pass outlets and online. Customers will have the flexibility to buy the pass when it’s convenient and use the pass when it best suits their schedules. They can start using their pass as soon as they purchase it, or wait until they need to use it. The pass is easy to use. For the first use, the customer activates the pass by inserting it in the top slot of the farebox on Metro and MAX buses. The farebox imprints the first use and expiration dates on the back. Once the pass has been activated, the customer simply swipes the pass in the farebox reader until the pass expires. Metro passes are available at more than 30 area locations and online at store.kcata.org. Visit www.kcata.org for a full list of pass outlets.